Searching the universe for strange new star systems can lead to some pretty interesting finds. And sometimes, it can turn up phenomena that contradict everything we think we know about the formation and evolution of stars. Such finds are not only fascinating and exciting, they allow us the chance to expand and refine our models of how the universe came to be. 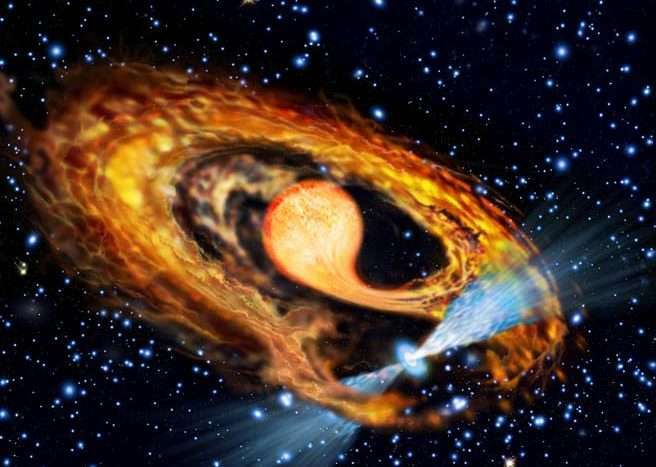 For instance, a recent study conducted by an international team of scientists has shown how the recent discovery of binary system – a millisecond pulsar and a low-mass white dwarf (LMWD) – has defied conventional ideas of stellar evolution. 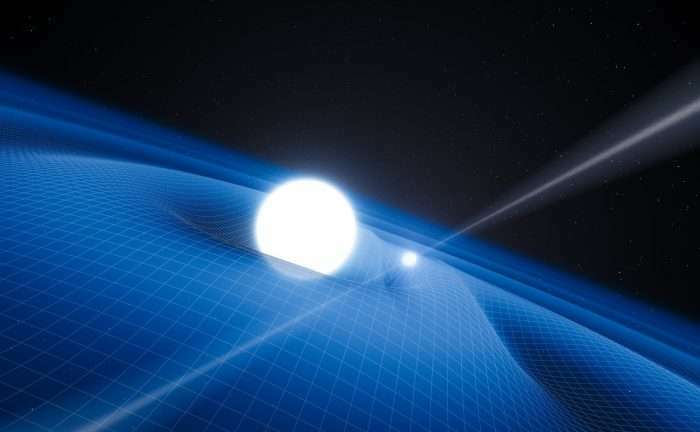 Whereas such systems were believed to have circular orbits in the past, the white dwarf in this particular binary orbits the pulsar with extreme eccentricity! To break it down, conventional wisdom states that LMWDs are the product of binary evolution. The reason for this is because that under normal circumstances, such a star – with low mass but incredible density – would only form after it has exhausted all its nuclear fuel and lost its outer layers as a planetary nebula. Given the mass of this star, this would take about 100 billion years to happen on its own – i.e. longer than the age of the universe. As such, they are generally believed to be the result of pairing with other stars – specifically, millisecond radio pulsars (MSPs). 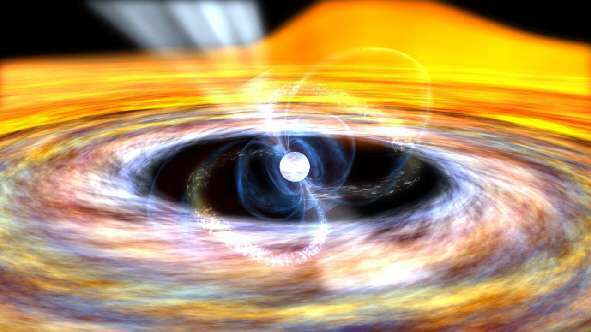 These are a distinct population of neutron stars that have fast spin periods and magnetic fields that are several orders of magnitude weaker than that of "normal" pulsars. These properties are thought to be the result of mass transfer with a companion star. Basically, MSPs that are orbited by a star will slowly strip them of their mass, sucking off their outer layers and turning them into a white dwarf. The addition of this mass to the pulsar causes it to spin faster and buries its magnetic field, and also strips the companion star down to a white dwarf. In this scenario, the eccentricity of orbit of the LMWD around the pulsar is expected to be negligible. However, when looking to the binary star system PSR J2234+0511, the international team noticed something entirely different. Here, they found a low-mass white dwarf paired with a millisecond pulsar which the white dwarf orbited with a period of 32 days and an extreme eccentricity (0.13). Since this defies current models of white dwarf stars, the team began looking for explanations. "Millisecond pulsar-LMWD binaries are very common. According to the established formation scenario, these systems evolve from low-mass X-ray binaries in which a neutron star accretes matter from a giant star. Eventually, this star evolves into a white dwarf and the neutron star becomes a millisecond pulsar. Because of the strong tidal forces during the mass-transfer episode, the orbits of these systems are extremely circular, with eccentricities of ~0.000001 or so." For the sake of their study, which appeared recently in the Astrophysical Journal – titled "An Eccentric Binary Millisecond Pulsar with a Helium White Dwarf Companion in the Galactic Field" – the team relied on newly obtained optical photometry of the system provided by the Sloan Digital Sky Survey (SDSS), and spectroscopy from the Very Large Telescope from the Palomar Observatory in Chile. In addition, they consulted recent studies that looked at other binary star systems that show this same kind of eccentric relationship. "We now know [of] 5 systems which deviate from this picture in that they have eccentricities of ~0.1 i.e. several orders of magnitude larger that what is expected in the standard scenario," said Antoniadis. "Interestingly, they all appear to have similar eccentricities and orbital periods." From this, they were able to infer the temperature (8600 ± 190 K) and velocity ( km/s) of the white dwarf companion in the binary star system. Combined with constraints placed on the two body's masses – 0.28 solar masses for the white dwarf and 1.4 for the pulsar – as well as their radii and surface gravity, they then tested three possible explanations for how this system came to be. 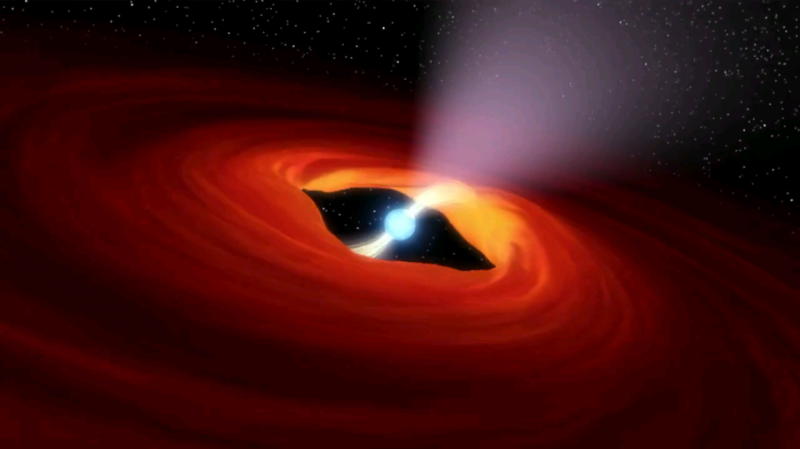 These included the possibility that neutrons stars (such as the millsecond pulsar being observed here) form through an accretion-induced collapse of a massive white dwarf. 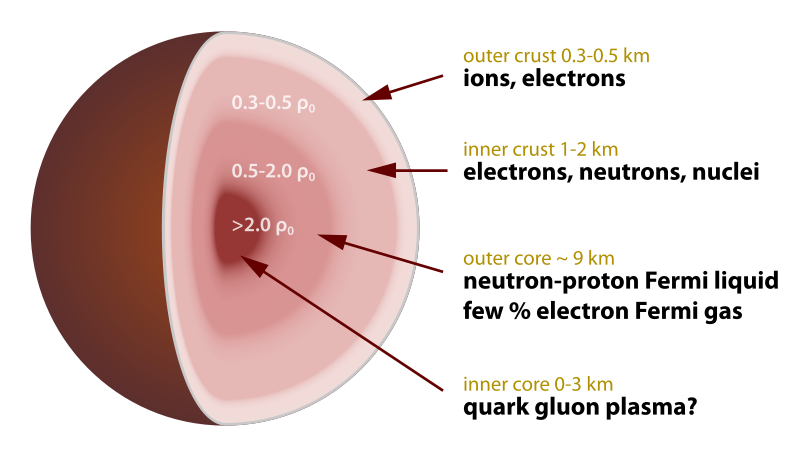 Similarly, they considered whether neutron stars undergo a transformation as they accrete material, which results in them becoming quark stars. During this process, the release of gravitational energy would be responsible for inducing the observed eccentricity. Second, they considered the possibility – consistent with current models of stellar evolution – that LMWDs within a certain mass range have strong stellar winds when they are very young (due to unstable hydrogen fusion). The team therefore looked at whether or not these strong stellar winds could have been what disrupted the orbit of the pulsar earlier in the system's history. Last, they considered the possibility that some of the material released from the white dwarf in the past (due to this same stellar wind) could have formed a short-lived circumbinary disk. This disk would then act like a third body, disturbing the system and increasing the eccentricity of the white dwarf's orbit. In the end, they deemed that the first two scenarios were unlikely, since the mass inferred for the pulsar progenitor was not consistent with either model. "These observations show that the companion star in this system is indeed a low-mass white dwarf. In addition, the mass of the pulsar seems to be too low for #2 and a bit too high for #1. We also study the orbit of the binary in the Milky Way, and it looks very similar to what we find for low-mass X-ray binaries. These pieces of evidence together favor the disk hypothesis." Of course, Dr. Antoniadis and his colleagues admit that more information is needed before their hypothesis can be deemed correct. However, should their results be borne out by future research, then they anticipate that it will be a valuable tool for future astronomers and astrophysicists looking to study the interaction between binary star systems and circumbinary disks. In addition, the discovery of this high eccentricity binary system will make it easier to measure the masses of low-mass white dwarfs with extreme precision in the coming years. This in turn should help astronomers to better understand the properties of these stars and what leads to their formation. As history has taught us, understanding the universe requires a serious commitment to the process of continuous discovery. And the more we discover, the stranger it seems to become, forcing us to reconsider what we think we know about it. Given the mass of this star, this would take about 100 billion years to happen on its own – i.e. longer than the age of the universe. And no self-respecting Merger Maniac dare suggest that the age of the universe might be longer than that allowed by the Huge Bang Fantasy. Long live the fantasy!